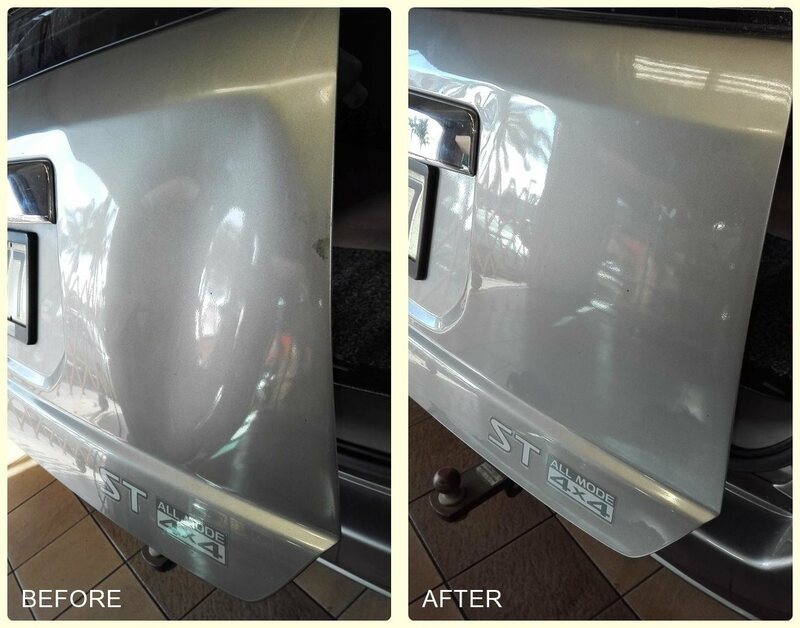 Our highly trained paintless dent removal technicians can remove most small to large sized dents, dings and creases from your car without needing fillers, paints or panelbeaters! The original factory finish remains undisturbed and the result is a smooth panel or surface area that looks like new again and maintains its structural integrity. Because of the fast turnaround time, minimal material outlay, and simplicity of the process all of this can be done at relatively low cost. So how does paintless dent removal work? We use specialised hand tools that enable us to access the underside of panels to gently manipulate the dented or creased area to it's original state. With the help of a white light - light stand we can see even the finest imperfections, which enables us to complete the job to the highest standard. To gain access to certain areas, often we will need to remove door, ceiling and boot linings which are fitted back into thier normal position once the dent has been repaired. Other techniques such as glue pulling can be used to pop dents out that are in tricky spots with limited or no access to the underside of the panel. "We've used Anton's services several times, fast, efficient, friendly competitively priced service, what more could you want. Give Anton, The Mobile Car Specialist a try. You'll use them again, when required, after using them the first time." Is the process safe for your car? Yes. We take very special care of each and every vehicle to make sure your pride and joy is not only restored to its former glory, but no other damage is caused in the process. In the unlikely event that something is damaged, we will cover the costs to repair it. We also have insurance in place to cover any defective workmanship - which gives both you and us peace of mind that your car will be repaired without hassle no matter what the cost! 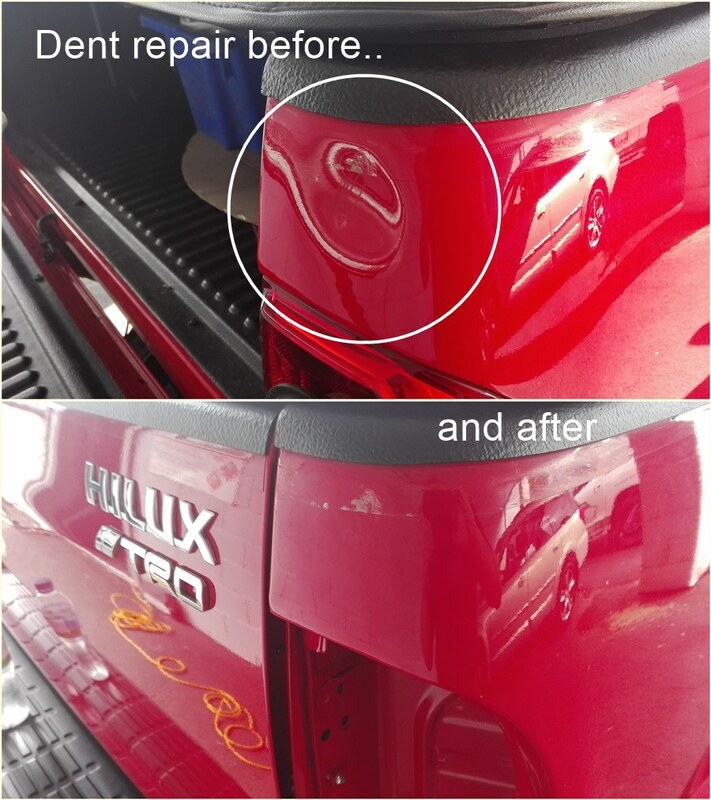 Here are some genuine reasons why paintless dent repairs are more beneficial than panelbeating..
Keep in mind - certain dents and panel damage cannot be repaired using these dent removal techniques. In such cases the services of a panelbeater are required. To find out if we can remove a dent on your car please contact us through our quote page. Prices vary as each dent is unique, and some require more work than others. However as a guide you can expect $150 - $250+ gst. Send us a photo of the damaged area using our green quote button above and we'll get back to you with a more accurate price.